The Mayor of Epsom & Ewell Councillor Neil Dallen made a very special guest appearance at Realistic Music Academy’s Christmas Showcase on Monday 17 December at the Epsom Playhouse. The festive evening of live music featured performances from all of the Academy’s workshops, coached bands and selected students. 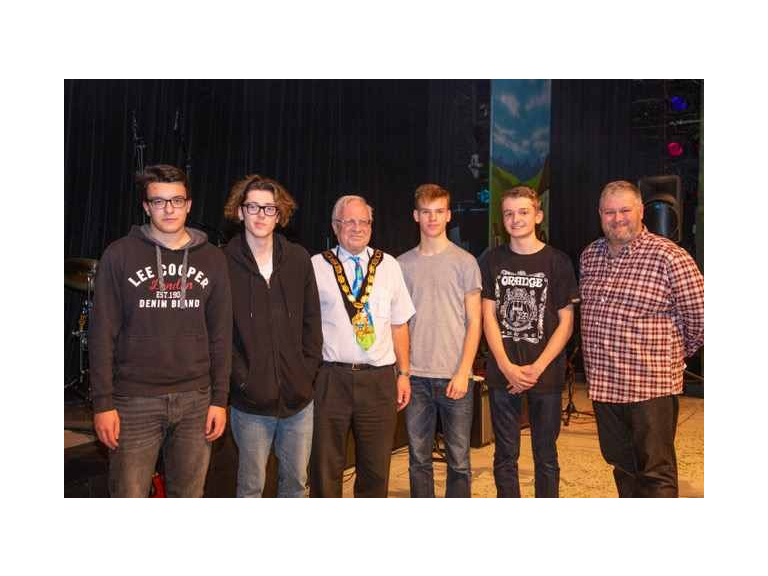 The Mayor judged the coached bands and the winning band was ‘Keep Calm’ who have been with Realistic Music Academy for nine years since they were seven years old. Keep Calm will record their song and release it on Realistic Music Academy’s own record label Realistic Records. Many thanks to Paul Taylor from What’s On In Epsom for hosting the event and the Mayor of Epsom & Ewell for judging the coached bands. Pictured winning band Keep Calm with the Mayor of Epsom & Ewell Councillor Neil Dallen and Paul Taylor from What’s On In Epsom.